Transitioning from a major divestiture, building a new identity, tripling in size and navigating an acquisition — all within four years. Theorem was not identified as a top-of-mind provider. develop messaging that supported this. SCORR Marketing to articulate the brand’s potential in a meaningful and memorable way. trade show and media plans to coincide with the new positioning and corporate identity. 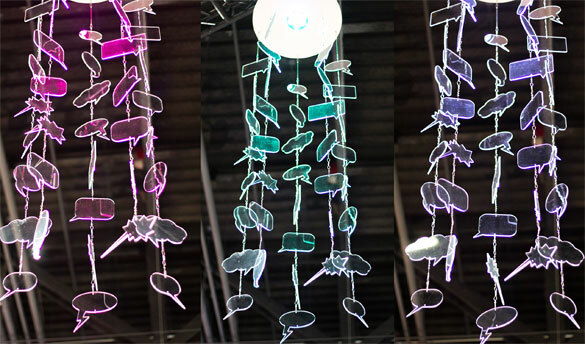 new brand as well as the company’s most ambitious step toward a new future. SCORR began to align Theorem’s strengths with values that would resonate with its target audiences. 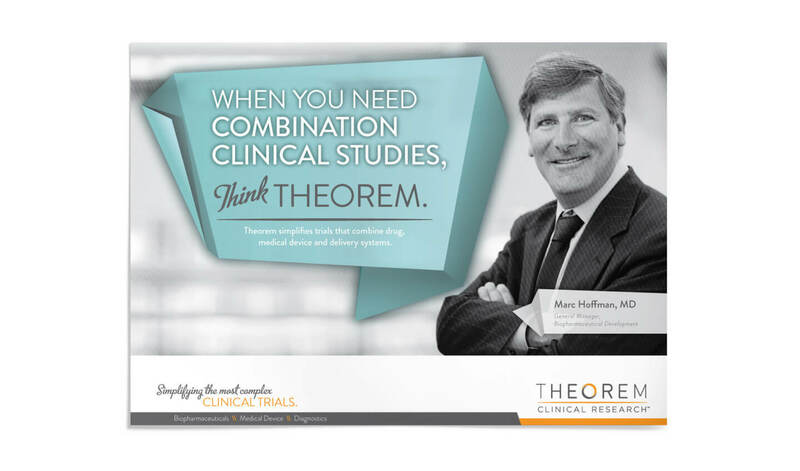 At the time, Theorem was a leader in complex, midsized trials for the drug, medical device and diagnostic industries. 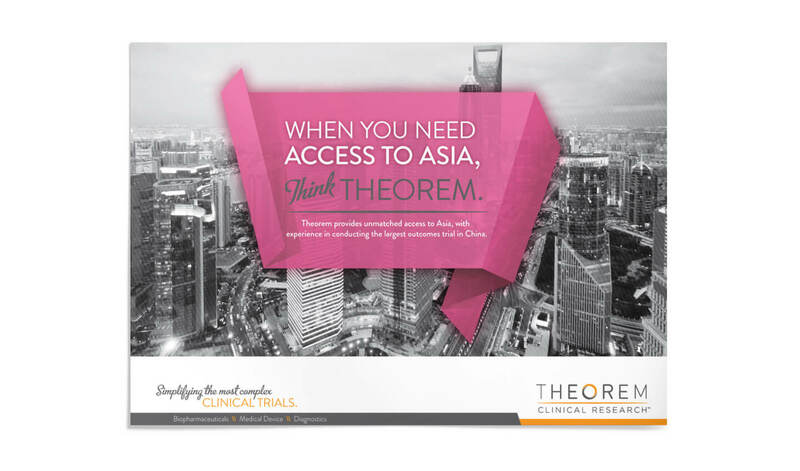 Theorem was committed to remain at the forefront of new health research technologies and techniques. 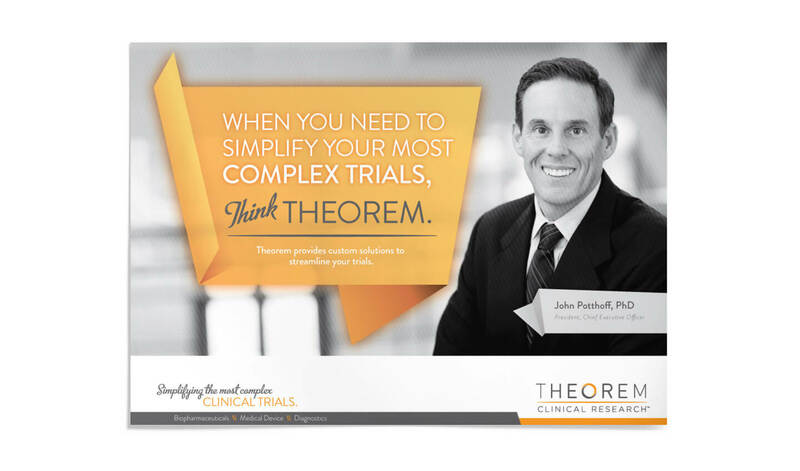 Acknowledging its ability to navigate the intricacies of complex clinical trials, the Big Idea — the visual concepts and core messaging that articulated Theorem’s value proposition — endorsed the speed, flexibility and expert guidance Theorem applied to every trial. Get out from living under the shadow of its past as a subsidiary of Omnicare Inc.
competition, generate leads and create meaningful relationships. merging and/or consolidating smaller CROs to round out in-house capabilities. give Theorem a competitive advantage over its competition. 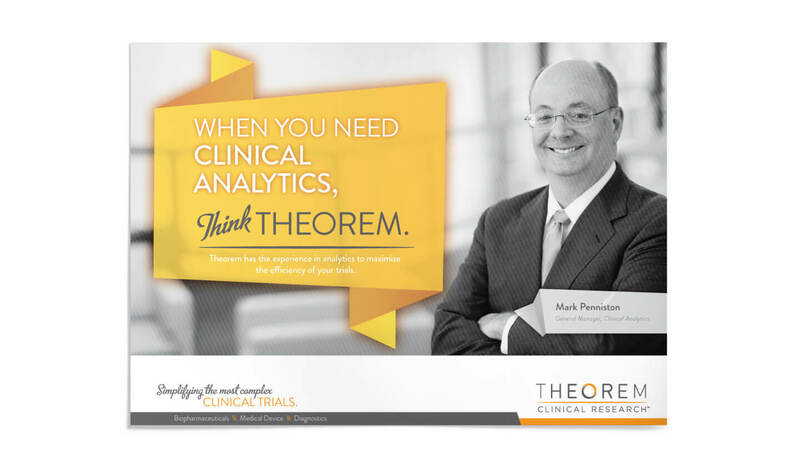 Theorem takes on fewer projects than big-box CROs, doesn’t only pursue the largest deals in clinical research and won’t push add-on services into your budget. That’s good news for you, because at Theorem more than anywhere else, your trial is important. SCORR composed a guide for Theorem employees that covered the history of the company and the rationale behind Theorem’s communications strategies for business development, internal/employee affairs, recruitment and more. A video featuring Theorem employees sharing their thoughts about working at Theorem was created and played in the headquarters of Theorem’s front lobby. Theorem also distributed gifts (e.g., T-shirts, screensavers and new stationery) to drive internal acceptance of the new brand before its external launch. One of Theorem’s best sources of new employees was internal referrals. To increase the rate of internal employee referrals, SCORR created the “Orange Is the New Green” campaign, which promoted Theorem’s recruitment and incentive program. As part of the campaign, SCORR developed a direct mailer, email template, dedicated microsite and more, for internal use. 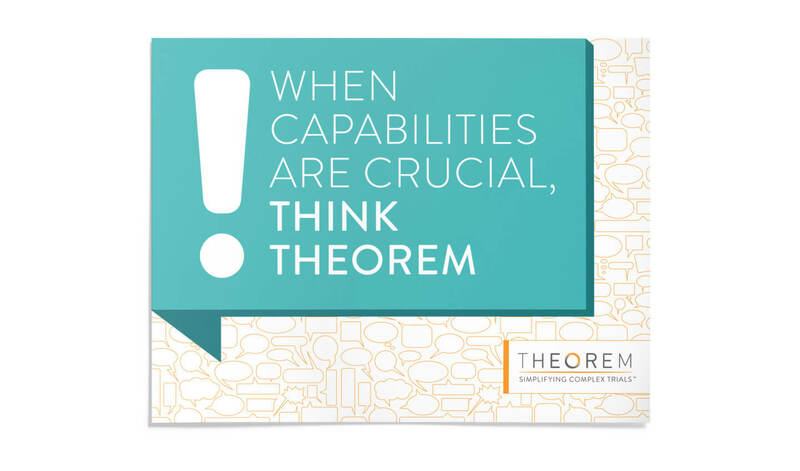 In addition to these efforts, SCORR reinvigorated Theorem’s recruiting program around the “Think Theorem” campaign. Both provocative and motivational, this campaign clearly articulated Theorem’s desire for passionate candidates seeking demanding, competitive and fulfilling careers. This comprehensive, integrated program included recruiting events, digital media and a LinkedIn campaign, and ultimately raised the level of quality and talent companywide. 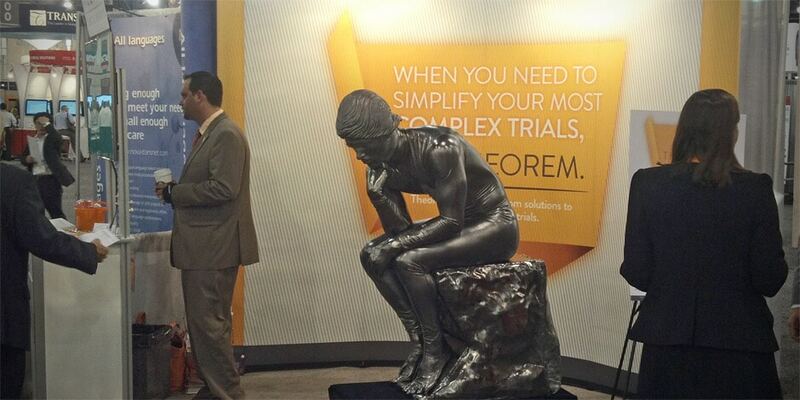 The Theorem Thinker: A living statue of “The Thinker” sat in the booth and interacted with attendees; the booth giveaway was a trip to Paris to see Rodin’s bronze sculpture. What’s Your Theory? 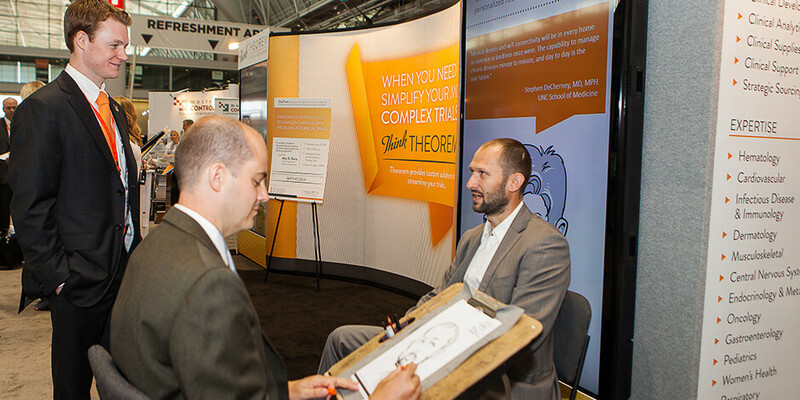 A caricature artist drew pictures of attendees who shared their opinions on the current and future states of the clinical research industry; the theories scrolled live on a video screen at the show and later were assembled into a booklet sent to each participant. 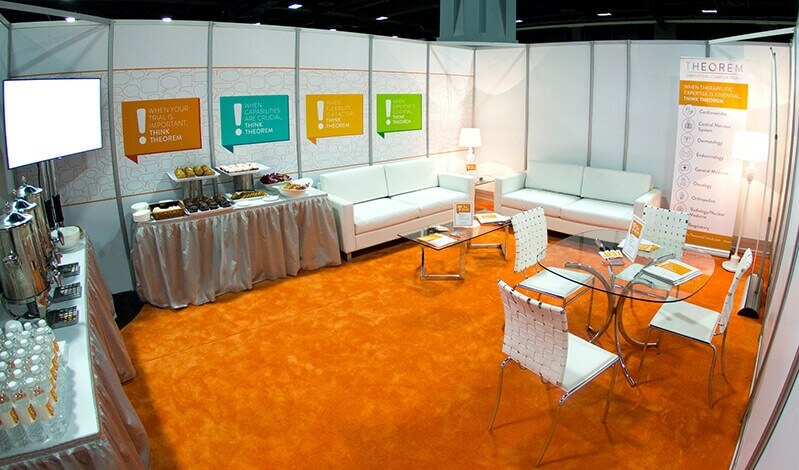 Movie Theatre: SCORR transformed a business suite into theater-caliber presentation space complete with a marquee and movie popcorn. 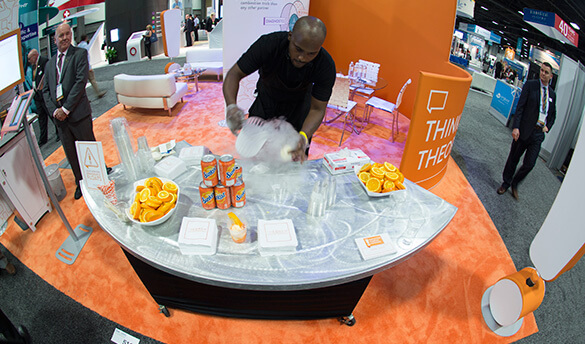 V!P Suite: SCORR created a VIP space for qualified leads, and the main booth featured a five-foot-tall statue of the Theorem exclamation point and a liquid nitrogen freeze tank to make orangesicle floats for visitors. Since 2012, Theorem also relied on SCORR to drive internal branding initiatives to build and maintain comradery among employees. 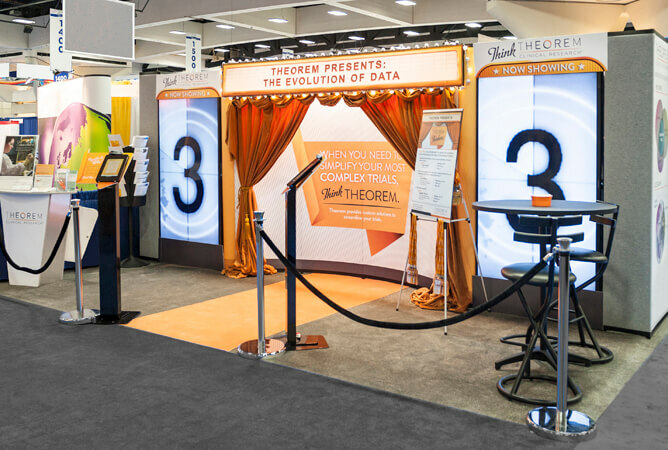 Earning steady growth in 2012, 2013, 2014 and 2015, Theorem continued to stake out its position as the flexible, trusted research partner. SCORR worked to ensure that the essence of the brand and Theorem’s established personality continued to resonate internally. 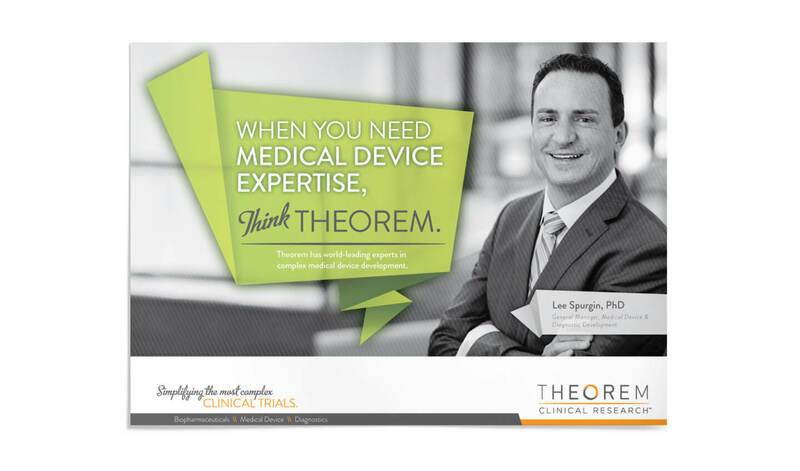 Theorem was recognized as a leading midsized provider of comprehensive clinical research and development services with a client base that included some of the world’s leading biopharmaceutical and medical device companies. 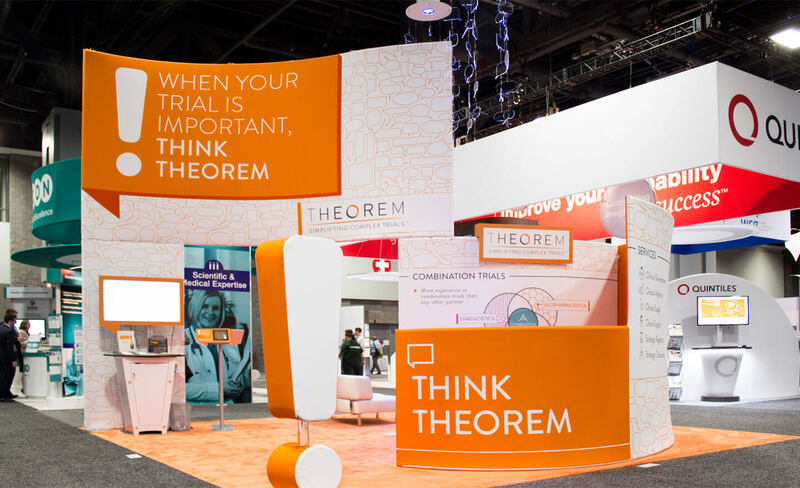 Theorem established itself as the research partner of choice for complex combination product trials, and expanded its team to more than 1,500 employees, with operations spanning more than 40 countries. Since partnering with SCORR, Theorem continued to introduce new business units and specialized service areas, and the quantity and quality of its business opportunities expanded. One of those opportunities came to fruition when Theorem accomplished one of its less publicized goals: to be acquired. In Q3 2015, Theorem was acquired by Chiltern. To prepare for the public announcement of the acquisition, Chiltern turned to SCORR to develop a comprehensive communications plan. The plan encompassed all communications both Chiltern and Theorem would need to interact with internal and external stakeholders. Materials included press releases, media kits, emails, Q&A documents, PowerPoint presentations, call scripts and more — every facet of internal and external communication regarding the acquisition was directed by SCORR. Chiltern is now the leading, global midsized CRO with more than 4,200 employees across nearly 50 countries. Today, SCORR serves as Chiltern’s full-service marketing partner. Share: Transitioning from a major divestiture, building a new identity, tripling in size and navigating an acquisition — all within four years.